St. Louis lost a musical treasure with the passing of a legend, Mr.Johnnie Johnson. Long a fixture here on the St. Louis music scene, Johnnie passed quietly away in his sleep on April 13th, 2005. Right up until the end, Johnnie was out there doing what he loved best, rocking the 88's like no one else! We'll always have the gift of his 80th birthday party at the Botanical Garden, his incredible Old Webster Fest appearances, and countless others, including the honor of his performance at the 2005 STLBlues concert. 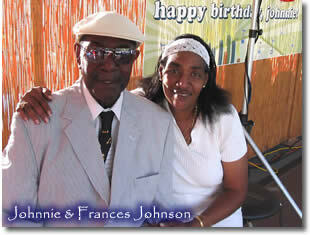 We have fond memories of visits to the Johnson household, spending time just hangin' out with Johnnie & Frances. At the tender age of 5, my son Dustin already had chosen Johnnie as his first musical idol. Johnnie was truly one of the most humble talents we had the pleasure of knowing, much like his friend Oliver Sain. We hope you enjoy our tribute page to honor our friend, Mr. Johnnie Johnson. Your talent, your heart of gold and your legend will not be forgotten ever. We will remember you as you were in person at Finale recently just lighting up your face, your smile and everyone in the audience when you tickled those 88s in person. You are going to be a sure hit in heaven!!!! We were very sorry to hear that Johnny passed away. We will greatly miss his humble virtuosity and generous soul. Once when I was working at the door at the Adams Mark for a Blues Society concert there, Johnny came to the door. The Kinsey Report was the band and Johnny, in all humility, asked me, "Is it all right if I come in? I'm on their album." Like I would not know who he was! I said, "Johnny, you're on EVERYBODY's album! Please come in." "Well, Johnnie Johnson, you're still packing the house!" These are the first words that came un-thought from my mind and un-impeded from my heart and straight through my mouth as I put down my cane and turned to face, to share myself with, and to entertain the hundreds of people who had came to pay their last respects to my/our beloved friend and master musician, Mr Johnnie Johnson. The words passed by, hung in the air for that brief second of time that it takes for them to be recognized, passed in through to the heart, the hearts in turn setting in motion hundreds of pairs of hands in to applaud in agreement. In this darkness and confusion that is so prevalent in this world, another rare & comforting light has burnt itself out. Johnnie's music (and Johnnie himself) was therapy for the wounded and tired spirit stumbling down this road of life. Let me bear witness to that. He and his music has both soothed my soul and quieted my mind. Now, when I begin to second-guess myself, or start to give in to doubt and fear that I may have lived a life in vain, or when I start in on myself for choosing a career that can be a tedious, underpaid, fractual and, in many cases, a self-destructive and unrewarding field...? I will remember Johnnie. Johnnie will always be my role-model. He was able to take the blows, the inevitable slights, the panic attacks, all the while managing to avoid the political entity which only destroys......and I will always remember that the pleasure that I strive to share with the world comes from within, and that it is a gift that comes through me and not from me!